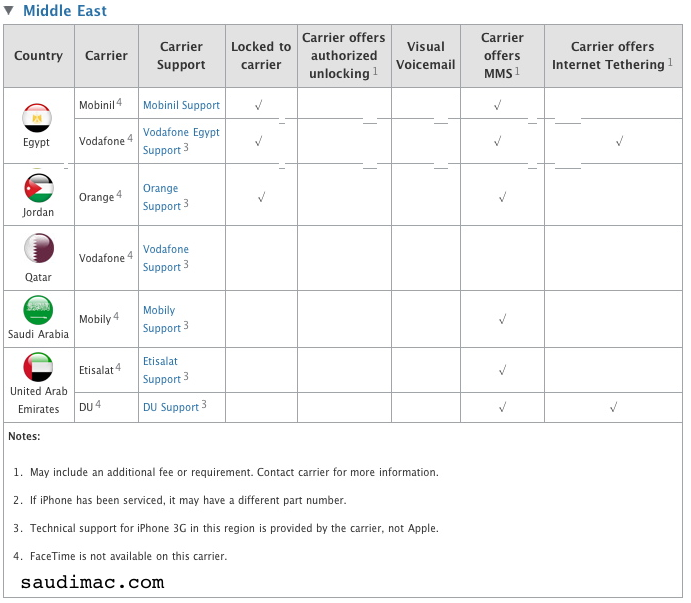 Yesterday Apple updated their Locating iPhone wireless carriers support page to include a small note regarding FaceTime for Middle Eastern countries. Note number 4 says that FaceTime is not available on this carrier. Tunisia is missing from the list, also Tunisia’s iPhone page does list FaceTime as a feature. Remember we are talking about iPhone 4 running iOS 4.1 or later. FaceTime is working on iOS 4.0.2.
â€¢ Import your own iPhone 4. iPhone 4 models sold from every other country have FaceTime enabled and you could try to order from the UK Apple Store and ship using Aramex. Just avoid scalpers that are taking advantage and raised the iPhone 4 prices again. â€¢ If you bought an iPhone 4 from any of these Middle Eastern carriers then return the iPhone 4 and ask for a refund. It is not carrier issue, the issue is The Model number, Apple’s update will vanish facetime from your mobile if you update even anywhere. Thanks very much Mr. Rehan it means i should not update until apple do something about it, right. Yes! don’t update until Apple clears this issue. & for those who already update & lost facetime, they can install an App from Appstore called “TANGO Video call” for free, it is almost same like Facetime, & works with Wifi & 3g with iphone 4 & 3gs. Besides, jailbreak for iOS 4.1 isnt available as of the moment still. limra1n . com released a Jailbreak for 4.1 few minutes ago so now what? is there any patch on cydia for enabling facetime on 4.1os? What about Bahrain? Why isn’t Bahrain mentioned anywhere? I have been trying to figure out how apple has disabled Facetime on 4.1 IOS. In theory once Jailbroken we can easily activate facetime back on and as we know mobily is not blocking it will work instantly too. As today the Limera1n JAilbreak has been Released i will get back once i try and experiment all the possibilities. @asim: Did you reach anything with the plists? Hi all , am using iphone4 from mobily with firmware 4.0.2 , am having facetime in it , I saved my SSHH at cydia first to ensure downgrade using TinyUmbrella , then i apgraded my Iphone 4 to 4.1 and JB wid Limera1n , hence face time disappered as expected , i went after thru the cydia patches to solve the problem by adding http://iphonedelivery.advinux.com/ source like everyone else tried , but failed to solve , i tried all latter patches but of no solution ,like da patches we used to do for da the 3G to display battery perectage …. As a conclusion ; no patch to solve Model MC603AE of iphone 4 yet , may be for ever , so now am downgrading it back to 4.0.2 to have facetime back …. & Pls update us if you get it back after downgrading. does facetime work in brahain?? anyone know?